Looking for your next cookbook? In this article I’ll show you 15 must-have cookbooks that I either own and love or are on my wishlist. Even better, cookbooks make the perfect gift idea since they are relatively inexpensive yet can be a completely personalized gift. Cookbooks are one of my favorite treats to myself as I love the beautiful imagery, author stories, & the feeling that the recipes are specially curated. I love Pinterest recipes as much as the next person, but something about a cookbook seems so much more special to me. Also, I love knowing the recipes have been tested and thoughtfully written to make sure that cooking them is as seamless as possible! My favorite cookbooks are ones that take classic recipes and make unique twists with the ingredients, preparation, or presentation style. Plus beautiful images seal the deal for me...there have been many days where I am too lazy to cook but I can be found flipping through the pages drooling over the images! 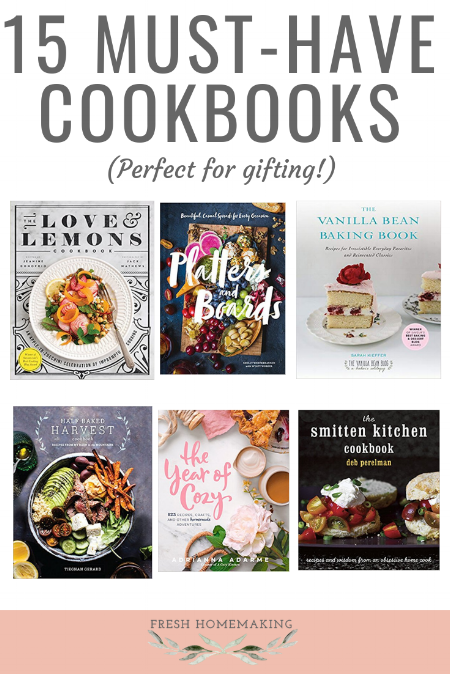 Not only are cookbooks the perfect treat for yourself, they also are one of my absolute favorite gift ideas. They are incredibly versatile for any occasion, relatively inexpensive, and can be personalized so much to the recipient. Looking for a gift for a newlywed (see #3) Or the hostess with the mostest (see #12) or the veggie lover (see #7)? There’s one for everyone! I also love gifting cookbooks because it not only is a beautiful gift, but it’s functional and creates an activity that the recipient can do and they will always think fondly of you after making a recipe! Beautiful, functional, and memorable are the perfect factors in a great gift! Fresh Homemaking is a participant in the Amazon Affiliates Program. These links are affiliate links which means I may earn a small commission, but all opinions are my own. This is probably my favorite cookbook in my collection. The author's stories and notes on each recipe are so beautifully written and the photos are absolutely stunning. It is filled with recipes for comfort food classics with a fresh twist to elevate them into something magical. My personal favorites are the 5 Ingredient Honey Beer Bread (picture below) and Wild Rice and Havarti-Stuffed Acorn Squash. Plus I'm dying to try the apple ricotta pancakes with bacon butter and Pumpkin Tart with Chai Cream and Maple Pumpkin seeds. Can you say yum? This cookbook has recently become on of my go-tos. The author is dedicated to creating healthy and and simple recipes using whole ingredients. 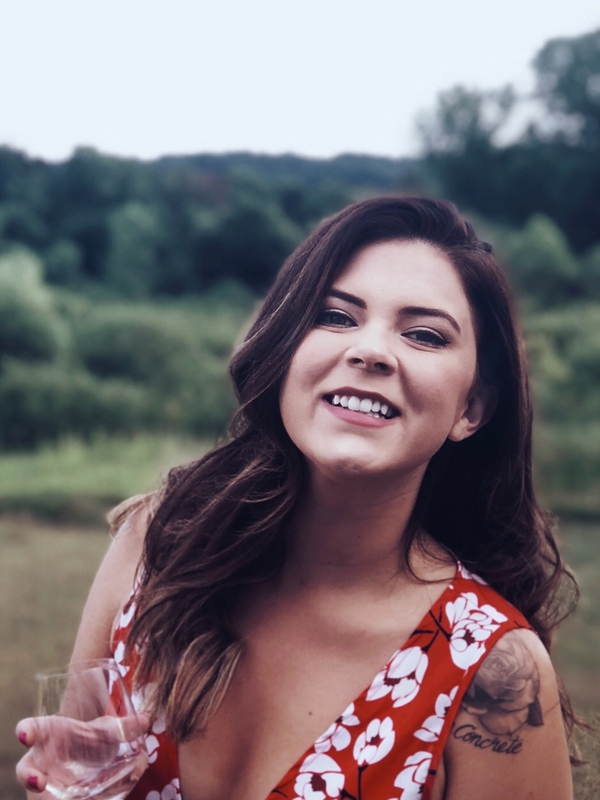 I also learned so much from the introduction section where she discusses the importance of whole ingredients and stocking your pantry with healthy alternatives. Some of my favorite recipes have been the apricot and rosemary glazed pork tenderloin (my new favorite way to make pork) and blueberry coconut morning porridge. I can’t wait to try strawberry bourbon ice cream and apricot and olive oil granola clusters. I bought The Newlywed Cookbook as a gift to my husband and I shortly after our wedding. The author has such a beautiful message about the joy of cooking as a couple, helpful tips on stocking your pantry, and the meals are perfectly portioned for couples. I only wish there were more photos in this book, but the recipes make up for it. Even if you’re not a newlywed, I highly recommend this book for foodie couples! I’ve loved the carrot cake bars with buttercream frosting and can’t wait to try the linguine with sausage and the skillet cornbread. I absolutely love following Chrissy Teigen on social media. She is hilarious, grogeous, yet somehow still down to earth and relate-able. Her cookbook made me love her even more as the recipes are delicious and there is a healthy dose of humor on each page. This cookbook is a new one for me, so I haven’t dived into making any of them yet, but I love the blend of comfort food classics and asian fusion recipes in the book. I mean roasted jalapeno and chorizo queso and “actual drunken noodles'“ in the same book? Count me in. I love this cookbook because it is so different than any others out there. It combines fun crafts and amazing recipes all in a super cute and feminine way. The crafts include ones like beautiful hand-painted pillows and a holiday wreath. But the real winners here are her amazing recipes (because food always has my heart) like no-bake pumpkin chiffon pie and a few fun variations on flavored butters, like salty honey-matcha butter. For anyone looking to up their pie baking and Thanksgiving game, this is the book. There are so many unique yet delicious pies in this cookbook and the pictures are amazing. I have made the Trifecta Pie (chocolate-peanut butter-pretzel) shown in the picture below and it was a huge hit. Some others I’m looking forward to trying are the Samoa Pie and Strawberry Shortcake Pie. Just a note- Some of the recipes in this book use appliances and tools that not everyone may have (like a food processor and torch), but many are easy recipes that require no special tools. I absolutely love how this cookbook is focused on a simple approach to eating what’s in season. Instead of organizing chapters by type of recipe, she organizes them by the main ingredient of the dish. So if you just went to the apple orchard and have tons of apples around, there’s a whole chapter on recipes that feature apples. Even better, she organizes each ingredient by the time it’s in season, so you have a handy guide of what produce to purchase based on the season. It’s also a perfect recipe book for someone who is moving towards being plant-based as it features vegetarian dishes, like blackberry basil bruschetta or grilled mexican corn salad, with simple, whole ingredients (no crazy meat replacement recipes here). This is a new cookbook for me so I haven’t had a chance to make anything yet, but I bought this book solely for Sarah’s famous “Pan-bangin’” chcoloate chip cookies. Basically, it seems like the perfect recipe for crispy on the outside, gooey in the middle chocolate chip cookies that are made by banging the pan in the oven while cooking. This book features many other amazing recipes like braided chocolate swirl bread and and spice cake with coffee buttercream. While reading through this after I received it, I have to say it may be best for someone with at least a little experience in baking as the recipes may be a little complex for someone who has never baked completely from scratch. I don’t own the following cookbooks so I can’t give personal reviews, but these are absolutely on my wishlist based on the great reviews, recipes, and photos I’ve seen! OK, as I’m writing this post and looking at the photos of cookbooks, I’ve decided this is the next one I am going to buy. As a Minnesota girl, I’m totally fascinated by everything Southern. The accents, the food, and the culture. I definitely plan on buying this book as an introduction into southern food (with a modern twist). The photos are stunning, and with recipes like bacon bourbon brittle and vinegar chicken with alabama white sauce you can’t go wrong. In the short time I spent reading the forward to this book, I am already in love with the author’s straightforward and relate-able writing style and am heading to her blog now. This book features classic and unfussy recipes that are still beautiful, unique and look way too delicious for words. This book has raving reviews and I will definitely be making the gingerbread spice dutch baby and baked ranchero eggs with lime crema as soon as I add this to my collection! First, how beautiful is that cover image? I am totally in love with the concept of this book in that it makes food for hosting simple and straightforward. I always struggle with what to make for events, and the concept of arranging a simple yet delicious platter is so appealing. The author makes it so easy to create a platter with foods that compliment each other well and that require minimal cooking. While it’s perfect for hosting, many of the boards would be great for a quick and easy dinner that’s outside of the traditional norm of main dish plus a side. I would love to try making the breakfast in bed board and movie night board. If you love Chip and Joanna’s family-focused and lovable personalities as seen on Fixer Upper, you will absolutely love this cookbook. It features approachable recipes that the whole family will love, like quick orange-walnut sweet rolls and fried chicken with sticky poppy seed jam. And like with anything Joanna does, you know the book will be absolutely gorgeous! With many people raving about the benefits of reducing grain in their diets, it’s no surprise this cookbook has so many raving reviews. It not only features recipes that are all gluten-free, grain-free, dairy-free, and paleo, it also gives complete weekly meal plans along with shopping lists. The roasted chicken with thyme gravy and sausage and peppers arrabbiata are just a few of the amazon recipes in this book. This cookbook is full of delicious recipes perfect for potlucks. I’ve wanted this book for a while, but after reading that it also includes special notes on how to prepare and display food when you will be transporting it seals the deal for me. It is always so hard to find a recipe that will be easy to transport and still look nice, as well as worrying about keeping it warm or cool. Some of the recipes I can’t wait to try are the grits casserole and mashed potato bake. I don’t know about you, but after reading this list I am starving! Did I miss any great cookbooks? What is your favorite cookbook of all time?